The project is to change the traditional use of 3 stones Stoves that our parents has been using by collecting 3 stones and arranging pieces of Wood as fuel and cook with it without regards to the smoke emission that affects their lungs especially of the women and their children when cooking at home situation. The alternative locally is a minimum charcoal clean stove which is made by cutting the appropriate shapes from metal sheet. It is molded to shape with a deep chamber with a ceramic liner as insulator of heat inside. When cooking the cooking pot seats on the holder on top. It has a door way below which is used for fanning and received the ashes during cooking. Cook stoves are designed to help means of cooking delicious meals and effectively. The stoves has quick starter and lights easier, retains heat efficiently, is portable and reflects your status and help keep your kitchen neat. The new/ash collector does not leave black and spot or ashes behind so cleaning is a breeze. The BEHAVIOUR that the project is trying to change is encouraging all households in the community to use a clean cooking stove at home to the impact of deforestation and its effect on climate change which is widespread OBJECTIVES To contribute to the improvement and production of domestic Cook stove in Ghana for 200 self-employed micro businesses within the period of 5 years. ACTIVITY-There will be Capacity building of medium and micro producers of clean cook stoves and Acquisition of raw materials provided for the fabricators and Conduct community awareness of the clean cooking products quality control with an Establishment of a consumer production unit. OUTPUT-The Cook stoves will be sold by producers from the regions. Adequate raw materials purchased for the producers to produce more stoves. There will be a Community awareness programs conducted in the regions in Ghana for the products among Consumer and production sites will be established. SUSTAINABILITY-The project will ensure that Producers have enough raw materials to produce. There is a social and Political will to produce more, adequate human resources to re-produce more cook stoves. Use of local policies to address cook stove issues and constant testing of cook stove product. MONITORING-There will be Monthly visits to manufacturing sites to report on activities, Quarterly review meetings, Data on Production collection and External evaluation. The project will meet the community target especially women in households 70% men in food business 305 and institutions that provides food by using fire and especially poor cooking materials the produce smoke that affect their health during the implementation of their livelihoods. Once every week the team of staff will visit compoude and homes to mount an Education Plat form that will sensitize community people this will be done with talks and role paly that will appeal to the emotions of the community consumers people to aske questions and these questions will be answered with illustrations and demonstration to appeal to the people to buy the products. Our behavior-–underpinned by personal attitudes, beliefs, values, and social norms and practices–-is often deep-rooted and difficult to change. To make options available to consumers and decision-makers we need innovation to make sustainable technologies available, and we need the policy and pricing structures to make them accessible. In order to motivate shifts in behavior we need clear targeted messaging that helps people understand that climate change related impacts are local, personal, and immediate and that also empowers people to be part of the solution. As a result of community education through awareness and sensitization programs and activities conducted on Climate change and interfacing it with behavior change strategy of on one marketing and with best practices in using energy efficient Stoves, target participants were educated and all were stimulated to change and all of a sudden the trainees changed and to use the local clean cook stoves in fact the they used their transport allowance given to them to purchase the local clean cook stoves products just after the Awareness training and purchase over 40 locally made clean cook stoves. The enabling condition for the awareness training was very conducive and the participants had not seen the clean cook stoves before or even used it before. But the awareness program brought to light the effect of clean cooking in the present than the past use of smoky stoves in the Kitchen for cooking. The success key factor was: 1 – There is an evidence of the effect of unknown dangerous smoke in the kitchen to the female cooker. 2-Women are in need of a safe cooking device due to long hours of cooking with smoking stoves. 3-The women has found the need to get the clean cooking stove in the homes in the case of no liquid gas.. 4-The locally produced stove are not very expensive than the imported ones in the market. 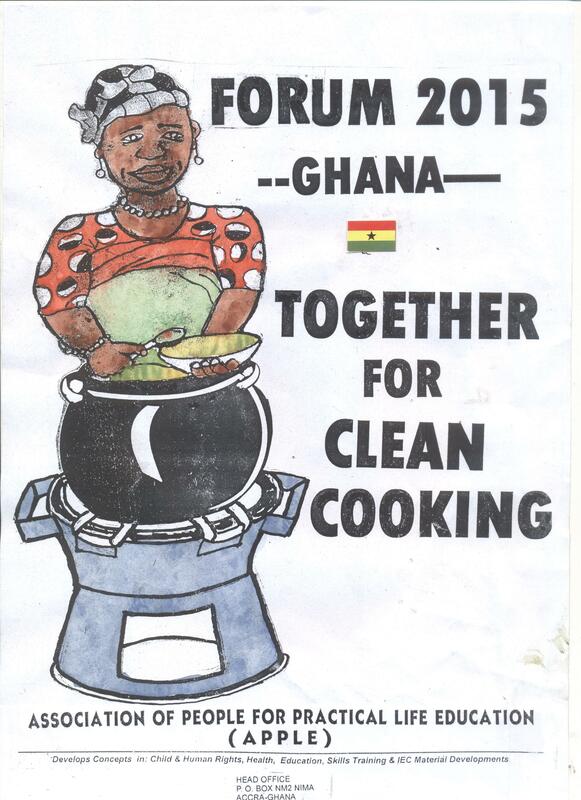 The locally made clean cooking stoves in this contest are manufactures in Ghana with local scrap metals and they use manual labor for the production and it needs an improvement. At least it is affordable and can be carried along in the kitchen. A research has proved that the clean cooking system of limiting greenhouse gas into the atmosphere is working but at a slow pace. 1-COMMUNITY- the Meteorological services on climate changing with regards to the weather in the case of rain fall and add issue of Global warming and Green gas effect on the poor communistes leasing to flood and drought in the northern and the middle belt of Ghana. 2-SOCIAL- Failed crops as a result of heat and drought, stress, floods in Ghana, Drought in the North and the Volta level to generate Electricity power is low and tis has affected national productivity.The Cocoa Industray has been recently in the cocoa produsing regions. 3-RETURN ON INVESTMENT- The project initiatives will CREATE and SUSTAIN CITIZENS AWARENESS and interest in Climate Change and local governance with key local actors about sustainable development, protection and management of natural and local resources and respectful to the environment. Considering the enormous complexity of the climate change phenomenon, it might be useful to follow the “divide and conquer” principle. Think about the best ways to encourage people to change their behavior, even in small ways; inspiring conversations, practices, art, and more can shift perceptions of climate change science, alter cultural norms regarding transportation and diet, or promote stronger values of sustainability. The project will collect specific data on the use of Clean cook stoves in the communities for Documentation and analyzed them. The Pictorial information will be turned in to a Video documentation that will be shown to other communities on the use and effect after using a Clean cooking stove at home.